The widespread adoption of enterprise self-service BI systems created new opportunities to further digitize and democratize business decision making, thus making it more effective . However, the companies poised to reap the benefits of modern BI rollouts identified a set of common “evolving challenges” around sustainability, governance, and risk management that interfere with their ability to make a lasting impact. Despite the efforts by leading self-service BI vendors to re-calibrate and introduce local governance features, the issues that precipitate these challenges are often rooted in the data realms with scope beyond the self-service reporting system, such as Tableau server. Questions of trust can arise with regards to various segments of the data flow or landscape related to business reports and underlying data sources. These questions may require resolution in either provisioning or consumption data layers within the organizational data architecture. And sometimes, they could propagate down to the raw data layer in the original data source or data store. Hence, there is a need for a data catalog that enables enterprise-wide tracking, processing, and intelligent management in each of these data layers of the enterprise data architecture, and with the potential to enable data citizens at large to maximize the value of data. Such a catalog treats information assets as a treasured resource and offers a preventive remedy to the common pitfalls of self-service deployments. As noted in my previous blog post, a catalog built on a data governance platform enables trust, accessibility, and better understanding of the data sources and sets that feed into BI reporting and analytics. Today, I’d like to expand this concept of achieving enterprise-wide trust in data to focus on the importance of cataloging and governing the BI reporting layer itself in the context of global data landscape. Let us count the ways of how the reporting data layer can benefit from its automated registration with an enterprise-wide systemic catalog! We can explore the many benefits of modern data catalog functionalities for BI by examining the Collibra-Tableau data registration scenario unveiled in our latest release of Collibra Data Governance Center. 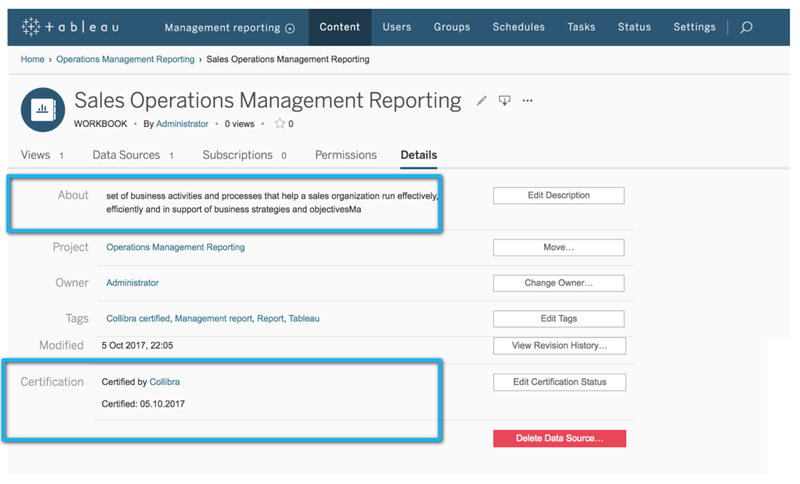 We nicknamed this use case the “Catalog of Reports.” It opens up immense opportunities for business users to create a trusted report ecosystem that is easy to maintain and consistent across multiple BI deployments, while keeping the the underlying data safe and secure. Registration of reporting server content with the data catalog that sits on a data governance platform like Collibra ensures that this key area of enterprise data analytics is open for cross-functional collaboration, processing, and enablement. And this approach leads to a better understanding of enterprise data analytics by data consumers. Additionally, human collaboration or machine learning can enrich the context around these registered report artifacts, and then broadcast this context back to the Tableau server to provide global trusted insights for business analysts. Examples of such context may include important relationships with other data assets in the platform, such as linking with the company business terms from business glossary. It could also be important stakeholder information, supplementary attributes or additional tags or linkage to common governance asset types (such as the “line of business”). Additional supplementary information could be extracted from the hierarchy of data responsibilities, processes or workflows, metrics or policies pertaining to a particular report, report certification details, and other linked sources. Additionally, registering a BI system in Collibra offers the advantage of global lineage that captures data flows into the reports and numerous characteristics pertaining to these flows, such as data usage. It will also help reduce the noise of bad data and assist with consolidation of redundant reports. You can implement data validations and automatic error correction based on common business rules. Taking this approach would position BI reports for proper stakeholder support, such as collaboration with cross-functional SMEs, as well as improved search functionality and tracking of the changes in report history tab. The result? Improved visibility and auditability of the self-service analytics. The tile view in the report section allows users to see pictures of the reports to help identify the ones they need at a glance. By drilling into the tiles, you can examine a given Tableau workbook or view asset page in detail. It contains various metadata fields of the report, some of which, such as tags or a view count, are loaded from Tableau server into Collibra. In the screenshot above, taken from the 5.3 version of Data Governance Center, we added annotation in green to highlight the hierarchy of Tableau lineage that has been imported into Collibra. This provides a very granular visual understanding of the asset placement within the Tableau system, which can serve as a great reference point that is easy for stakeholders of all backgrounds to digest . This lineage can also serve as a starting point for traceability of asset relationships beyond the Tableau system, which is where unique value of doing this data registration with Collibra really shines. You can also review the traceability of the associated data sources, business terms, processes, or any other assets that are directly or remotely related to the report via incoming or outgoing lineage. In our latest version, the interactive snapshots of these traceability diagrams can be tracked over time to help with change management. In summary, we established how the registration of the BI reporting and analytics system in Collibra can offer the enablement of trust by providing proper context and processing around these reports that can be sources or triggered from various parts of the entire data ecosystem. These capabilities address the self-service BI deployment challenges we outlined in the beginning of this post. The sustainability and governance are established organically by having reports join our catalog system of record with the support of features such as activity tracking, history of the changes, and advanced traceability – all built into our platform architecture. Organizations can successfully mitigate risks and enforce compliance policies by leveraging data protection and policy management modules within our platform. Our data help desk module can facilitate systemic and proactive issue management and take maintenance of these valuable reporting assets to a whole new level, largely due to the expanded visibility of the reporting assets and associated information. Stakeholder engagement and social feedback can also be scaled up beyond the local context of a given BI system onto the entire organizational landscape. Ellie is a passionate product manager, data warehousing aficionado, self-proclaimed fitness enthusiast, up-and-coming entrepreneur and occasional comedian. Prior to spending last ten years as multifunctional product leader, championing data management products from inception into successful adoption with high profile enterprise customers, she learned the art of building software as a consultant, programmer and system architect. Ellie holds a Marketing MBA from New York University’s Stern School of Business and bachelor’s degree in Computer Science, also from NYU.